You’ll love this easy chocolate frosting recipe! It’s so fluffy and rich, and it whips up in a snap with just 6 simple ingredients. Every good baker needs a few go-to frosting recipes. My top favorite will forever be Swiss meringue buttercream, with whipped cream frosting running a close second. 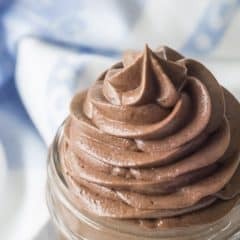 But an American-style buttercream (like this one) can’t miss when you need something quick and simple, and this easy chocolate frosting is on heavy rotation in my kitchen! WHAT IS THE TASTE/TEXTURE OF THIS CHOCOLATE FROSTING? This is an American-style chocolate buttercream, so it’s pretty much what you’d find in any American bakery. It’s whipped, so it has a light, airy texture, and it’s made with all butter for a richer flavor. The chocolate flavor is pronounced but not overly dark or bitter. WHAT CAN THIS CHOCOLATE FROSTING BE USED FOR? This recipe is perfect on vanilla cupcakes or chocolate cupcakes. You could also use it to ice your favorite brownies! And I think it would be amazing spread onto soft sugar cookies. The options are limitless. If you have a favorite dessert that you like to top or fill with chocolate buttercream, this is the recipe for you! This recipe whips up in a snap! You’ll have it made and ready to spread onto all your favorite treats in 5 minutes flat. Start with softened butter. Pop it into a big bowl along with a few pinches of salt and some cocoa powder. I like to use cocoa powder for this frosting because it’s no-muss, no-fuss, and it delivers a strong hit of chocolate flavor. Next, just add in about a third of your powdered sugar. Beat it all together with an electric mixer, just until all the ingredients are moistened. At first, it may seem really dry and crumbly, but as you continue to beat, it will come together. Keep adding powdered sugar, about a third at a time, until everything is well blended. Then add your vanilla extract and cream. If you don’t have cream, you can use milk, but I prefer the richer flavor and fluffier texture that cream provides. The amount of cream you will need can vary. 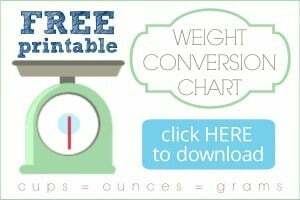 I find that anywhere from 3 tablespoons to 1/3 cup will work. You just want to get it to a nice smooth and spreadable consistency. Once you have the consistency you like, turn your mixer up to medium-high speed and whip the frosting until it’s light and fluffy. HOW LONG WILL THIS CHOCOLATE ICING KEEP? This buttercream is fine at room temperature for a day or so. It will become soft if the temperature is very hot, but it forms a thin crust on the outside when it’s exposed to air, so that helps it to not completely slide off the sides of your cake. If you want to make it ahead, you totally can! Just put it into an airtight container and refrigerate it. It should last in the fridge for a couple of weeks at least. When you’re ready to use it, just let it come to room temperature and give it a quick whip to re-fluff the frosting. This frosting can also be frozen. It will last a couple of months in the freezer. Again, just let it come to room temperature and then give it a quick fluff. 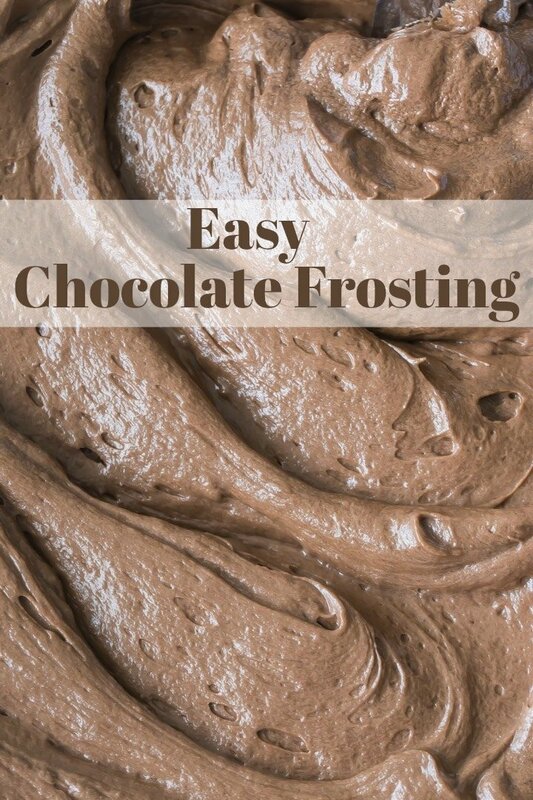 I think you’ll get a lot of use out of this easy chocolate frosting recipe! It’s super-quick to make and tastes delicious on so many things! 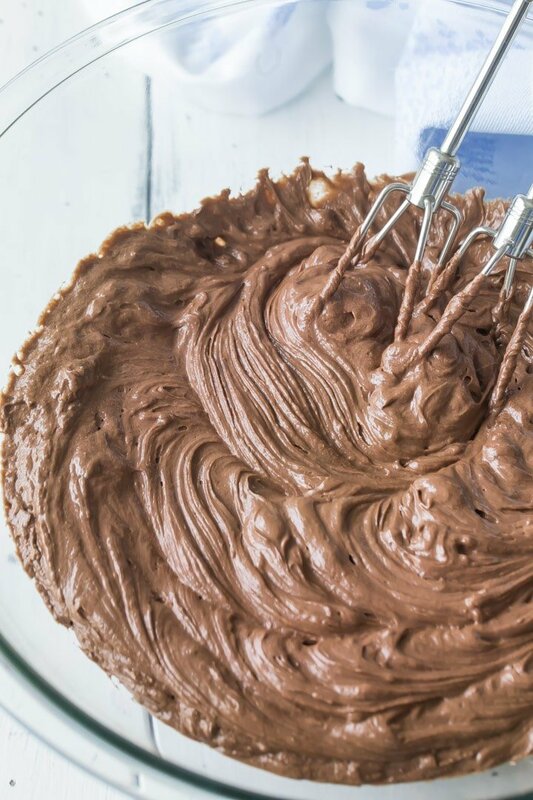 You'll love this easy chocolate frosting recipe! It's so fluffy and rich, and it whips up in a snap with just 6 simple ingredients. Stir in the cream* and vanilla, then turn the mixer up to medium-high speed and whip the frosting until light and fluffy. *The amount of cream needed can vary. Start with 3 tablespoons and add more if necessary. You just want it to have a nice spreadable consistency, without being too loose or runny. Super easy and looks delicious! I would probably just eat it by the spoonfuls. I am absolutely bookmarking this!! I’m frosting challenged but this seems totally doable. And we’re eating keto but I can easily swap the powdered sugar out. LOVE!! I’d love to know what you would swap the sugar out with to make it keto. I am keto too, and use Swerve confectioner style sweetener for frosting, and it’s perfect! Thanks for the great tip Michelle! Is it awful that I sort of just want to eat this by the spoonful? I just want to lick the spoon!! Great on brownies, cake or anything! This looks like the absolute perfect chocolate frosting! This is such a quick and easy recipe! 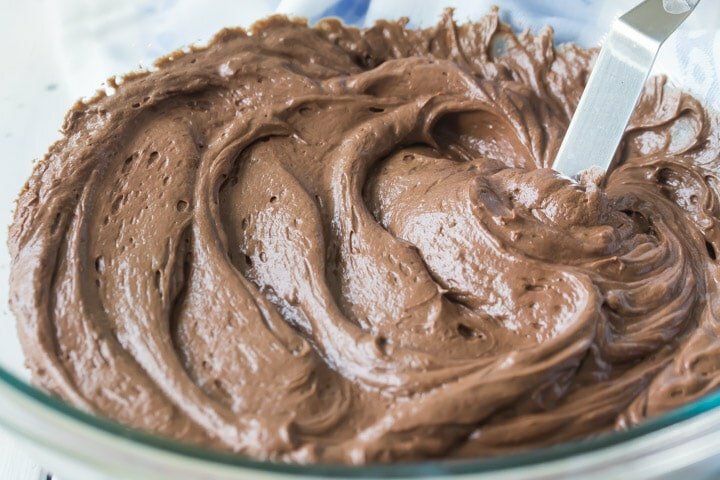 It’s the perfect go-to recipe to have on-hand for chocolate frosting! ahhh this frosting looks straight up LUXURIOUS-those pictures are making my mouth water! Perfect. I used half and half. I’ve used these ingredients before, but not in this order, and that makes all of the difference! Thank you! So happy it worked well for you! Thanks so much for the positive feedback and the 5-star rating, Gwendelynn!